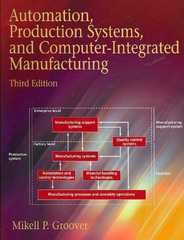 Automation, Production Systems, and Computer-Integrated Manufacturing 3 Edition This book provides the most advanced, comprehensive, and balanced coverage on the market of the technical and engineering aspects of automated production systems. It covers all the major cutting-edge technologies of production automation and material handling, and how these technologies are used to construct modern manufacturing systems. Manufacturing Operations; Industrial Control Systems; Sensors, Actuators, and Other Control System Components; Numerical Control; Industrial Robotics; Discrete Control Using Programmable Logic Controllers and Personal Computers; Material Transport Systems; Storage Systems; Automatic Data Capture; Single Station Manufacturing Cells; Group Technology and Cellular Manufacturing; Flexible Manufacturing Systems; Manual Assembly Lines; Transfer Lines and Similar Automated Manufacturing Systems; Automated Assembly Systems; Statistical Process Control; Inspection Principles and Practices; Inspection Technologies; Product Design and CAD/CAM in the Production System; Process Planning and Concurrent Engineering; Production Planning and Control Systems; and Lean Production and Agile Manufacturing. For anyone interested in Automation, Production Systems, and Computer-Integrated Manufacturing.